NOVA focuses on voter registration, research, an advocacy in the Northeast Ohio area. 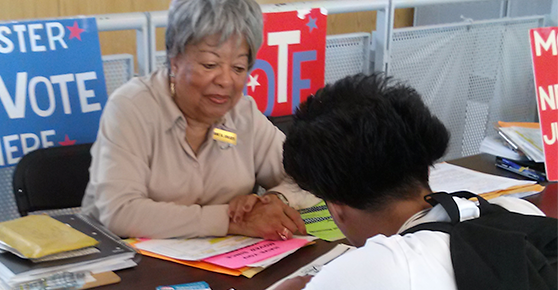 Thanks to our volunteers, in 2018, NOVA registered over 3,500 voters and completed 2,171 Vote-By-Mail Applications throughout target areas (including food pantries, government and social service agencies, schools, supermarkets, libraries, health care organizations, jail, and neighborhood organizations). NOVA has registered thousands of under-represented voters in food pantries, social service agencies, supermarkets, libraries, correctional facilities, schools, and a local university. Since 2010, NOVA has registered approximately 14,000 people. NOVA uses its own research to maximize voter accessibility for all qualified individuals. The research documents policies and legislation that unnecessarily restrict voting. As a result, NOVA research and advocacy have improved local and state election laws. NOVA has testified locally, state-wide, and nationally resulting in improved voting accessibility. In addition, NOVA collaborates with organizations such as Cleveland Votes, State Voices, and the Cuyahoga and Ohio League of Women Voters to further improve voting access for under-represented populations.